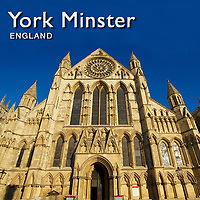 Pictures of York Minster. Images & photos of the great gothic Cathedral. Also buy stock photos & photo art prints. The minster has a very wide Decorated Gothic nave and chapter house, a Perpendicular Gothic choir and east end and Early English north and south transepts. The nave contains the West Window, constructed in 1338, and over the Lady Chapel in the east end is the Great East Window, (finished in 1408), the largest expanse of medieval stained glass in the world. In the north transept is the Five Sisters Window, each lancet being over 16 metres (52 ft) high. The south transept contains a famous rose window.